Allie grew up in Houston, Texas, and Memphis, Tennessee, before moving to New York City for college. At New York University she studied Politics, Food, and Public Health. Food and urban agriculture have always played a large role in her life: she grew up cooking every night with her parents, watched every food documentary and movie that she could, and read any book she could find about the food industry. After graduating from NYU in 2014, she moved to San Francisco to work as the West Coast sales associate at 18 Rabbits, an organic granola bar company. After one year of working in the 9-5 office world, she knew it wasn’t for her. 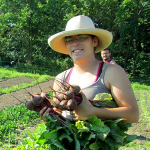 She joined UVM’s Farmer Training Program for hands-on experience and to gain knowledge and skills about farming that she could use to create a food justice ecosystem. After finishing the Farmer Training Program, Allie thought nothing else would ever be as good. But it has been in the months following that she has been able to see how the six months spent at Catamount Farm prepared her for her next steps. She is currently farming in Oaxaca, Mexico, learning about permaculture and NAFTA repercussions. In March, she will begin an apprenticeship at Stone Barns Center for Food and Agriculture in Tarrytown, New York. Eventually she plans to work in the world of food policy, small farmer support, and Southern joy. These steps would not have come without the Farmer Training Program, her cohort, and the Vermont sun. Anthony grew up in central Massachusetts and joined the Army after high school. He was stationed in Kentucky, and moved back to Massachusetts after his contract ended. He worked as a field operations technician for a major cell and radio tower company, allowing him to spend his days traveling all over the Northeast, often to towers on mountains or in remote places. After almost five years, the scenery wasn’t enough. He started to feel as though he needed to find a career which gave him a feeling of accomplishment, and was far more essential to society than whether or not you have 4G coverage at the top of Killington. Anthony enrolled in UVM’s Farmer Training Program with the hopes that it would provide him with the skills and knowledge necessary to start and operate a successful farm business. 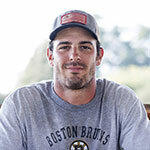 Upon completion of the Farmer Training Program, he started Headwaters Farm in Hinesburg, Vermont. In 2018, Headwaters Farm will be producing a variety of vegetables and duck eggs, as well as roasting ducks and geese and heritage breed turkeys. Headwaters will also be hosting workshops for military members and veterans over the course of the 2018 season, focusing on the healing aspects of agriculture and on systems to increase efficiency and reduce waste on the small farm and homestead. 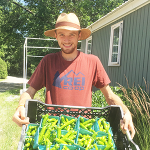 Anthony credits the Farmer Training program with not only providing him with the skills and base of knowledge he needed to start a farm, but also with showing him countless examples of great farms and farmers from which to draw inspiration for all the elements that make up Headwaters Farm. Zev came to UVM’s Farmer Training Program with big questions about the connections between food insecurity, white supremacy, and class disparity in the United States and globally. 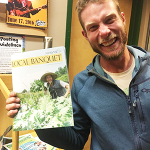 He attended the Farmer Training Program along with UVM’s Food Hub Management and Breakthrough Leaders in Sustainable Food Systems programs, hoping to gain a systemic lens through which to view the food system. Alongside his other studies, the Farmer Training Program gave Zev a strong understanding of all the factors to consider when working with the many parties involved in getting food from the soil to communities. Since graduation, Zev moved to Urbana, Illinois. 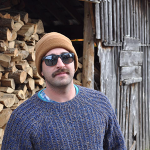 He is splitting time between freelance writing, consulting with a local nonprofit food hub project (The Land Connection), and working as a farmhand at a local goat dairy and farmstead creamery called Prairie Fruits. Taylor grew up in the panhandle of Nebraska as the fifth generation on his family’s farm and ranch. FTP was the jumping off point for Taylor. He will be spending the next year working in an urban farming residency with Big Muddy Urban Farm in Omaha, NE to grow affordable veggies for underprivileged families, helping educate and elevate a community to grow their own food, and helping spread the message of sustainable, ecologically healthy farming in a state that does not quite support the message. He has all the love and hope for the greatest alum group ever! 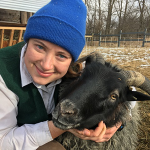 Annie stumbled into the world of farming as she searched for a career that fed her passions: working with animals, being outside, and connecting to the landscape around her. That was two years ago and she has yet to look back. The Farmer Training Program gave her the tools to move forward with her dream confidently. FTP gave her a great groundwork of knowledge about both the local-foods industry and the technical skills needed to fork in the field. She started FTP in 2016 in hopes of starting a livestock farm of her own. Now she is pursuing that full force; look for Scuttleship Farm lamb around Vermont in the future! 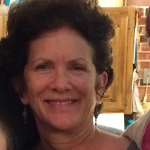 Karen came from a career in outdoor education and quickly fell in love with farming and gardening when she moved to Vermont. She worked for a school for a year with a little educational farm; there she was sold on the idea of growing food with the direct relationship of growing and cooking nutritious food for people who previously did not have access. She then went on to work as a farm hand on a few farms and decided she needed the practical intellectual skillsets provided by the Farmer Training Program. “When I was working for a farm I had no context of the big picture, I was just plugged into the daily task of harvest, sales, and none of the planning of how to make it all come together. The Farmer Training Program locked in my understanding of all of those things. That dream of having my own operation feels so much more realistic and possible because of those specific trainings in planning and the more intellectual sides of farming…I think about how long it would have taken me to get those pieces of knowledge and it would have taken me years without the Farmer Training Program.” Karen will be spending the winter working at Wayward Goose Farm, a dairy farm, in West Pawlet, Vermont. Ian started to dream of more fulfillment after too many days spent in front of too many screens with too little sunlight in NYC. He dwelled on memories of dirt-covered hands and the smell of manure from his time spent on Wisconsin farms. With a taste for entrepreneurship and a desire for something more than farmhand grunt-work, he found his way to the Farmer Training Program. These days, Ian is back in the big city, finding fulfillment through fish poop. At Edenworks, he uses aquaponics to grow veggies and fish for sale in grocers around NYC. At the aquaponic farm, he harnesses the productive power of a symbiotic ecosystem of fish, microbes, and plants. He wonders at the beauty of nature’s cycles and ecological symbiosis that he participates in every day. Ian is convinced FTP gave him a powerful combination of scientific knowledge, business acumen, and farming techniques that enables him to build a successful commercial urban farm and ultimately be a part of a solution to our broken food system. Isabella was born in Bordeaux, France and migrated to the US at a young age. Culturally still very divided. Food was, and is, a common theme across those cultures, “I was drawn to the universality of it. This food thing was omnipresent not only in places that I consider home, but in places I had visited far away. There may not be anything more special than sharing a meal with other humans. It is personal and vulnerable and utterly inspiring.” While she was cooking, she had also been farming on the side, where she caught the ‘bug’. She became unable to ignore the bug at about the same time she hit the brakes on cooking professionally, which ultimately led her to FTP, “Every day I am thankful for those 6 months in Vermont at the Farmer Training Program. I was able to not only learn the theory behind growing but the organization necessary to make a farm viable. Being exposed to a number of farms and farm models was invaluable. Almost as much so as the people I got to weed alongside.” Post FTP, Isabella returned south and has been working on as many farms as she can, and started the college adventure. 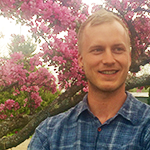 Andrew Bahrenburg is currently the National Policy Director for the Young Farmers Coalition based in Washington D.C. and prior he worked as the organizer and advocate for Rural Vermont. Andrew graduated from the Farmer Training Program in 2013 and served as the farm assistant and educator for the two subsequent seasons. 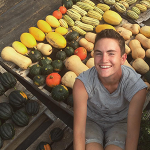 Before the Farmer Training Program, Andrew was a legislative aide in the United States Congress in Washington, D.C. Andrew believes, “there is an awakening taking place because of the injustices in our food system, including humanitarian, ecological, economic injustice. All of that is coming to a head right now and we cannot keep going into moral debt with the way that we have constructed our food system.” For Andrew, the Farmer Training Program helped prepare Andrew to marry his skill set to serve our country’s farming movement from a national policy level. Check out ways to get connected to your local chapter of the Young Farmer Coalition! Alisha took part in the Farmer Training Program in 2014 to gain a better understanding of the challenges faced by farmers with the intention of pursuing a career in agricultural policy. Prior to moving to VT, Alisha earned a degree in Environmental Policy and Marine Science from the University of California, San Diego. 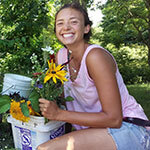 After completing the FTP, Alisha leased land in South Hero, VT and grew vegetables, herbs, and flowers for sale at the on-site farm store and local farmers’ market. In 2015, Alisha began graduate studies in Plant and Soil Science at the University of Vermont where she is presently working on her PhD. In the summer of 2016, Alisha and her partner acquired a farmstead in Grand Isle, VT. Alisha is grateful for the FTP connecting her with many wonderful farmers who continue to serve as supportive mentors and friends today. After completing the Farmer Training Program together, Kim and her partner, Matt Systo, purchased a 13-acre property in Barre, VT that was previously a dairy farm. There they created Old Soul Farm, a market garden consisting of one acre of vegetables, two hoop houses, and a continually increasing number of berries, fruit trees, and perennials. They also have a cut flower field and a medicinal herb garden located just outside their on-site farm stand. The farm stand is located in the barn where they also keep their flock of 55 laying hens. They sell a variety of canned goods and value added products in their farm stand due to the recent addition of a production kitchen on the property. First and foremost, they operate their farm as a homestead, striving to produce and preserve as much as possible for their own consumption and sustainability. With a heavy focus on permaculture principles, they plan to continue to design, plant, and graze as many of their remaining 12 acres as possible. They credit FTP for giving them the knowledge necessary to start and successfully operate their own farm within 6 months of graduating. Laurie worked last season at a new organic farm on Orcas Island, WA, Warm Valley Farm. In 2016, she was hired as field manager and loved planning everything from seed to harvest. Laurie would have never attempted this without the Farmer Training Program. Hadley started her farming career in 2012 after years of living in New York City. She moved to Vermont and joined FTP community in 2013 in hopes to achieve a deeper understanding of sustainable agriculture. Her experience with FTP was invaluable. It gave her the confidence and comprehensive knowledge she needed to take on even the most intense farming situations. After her time at FTP, she moved to Marin County in California to work as an apprentice and then eventually a manager at a goat and sheep dairy farm and creamery (Toluma Farms and Tomales Farmstead Creamery). For the last three years, she has been involved in all aspects of the farmstead – kidding / lambing, milking, land management, cheese making, etc. 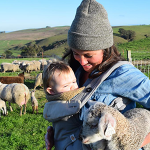 In January of 2016, in the middle of lambing season, she gave birth to her daughter, Una (Gaelic for lamb) and has continued working on the farm with her in tow. Todd got into farming through a CSA workshare program at Green Gate Farms in Austin, TX. He had quit his Boston lawyer job and was looking for a fresh start. After a brief stint taking culinary classes and studying agricultural and food law, he decided to dive into farming full time and enrolled in FTP. He loved the program’s comprehensive approach to all aspects of a farm business, and the great network of farmers he was introduced to through the program (a network he still relies on today). 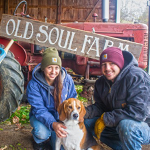 After a couple years working on different farms in Massachusetts, Todd and his partner, Suzy Kaplan, started Fat Sheep Farm & Cabins in Hartland, Vermont in 2016. They sell produce and eggs at area farmers markets and to local restaurants, and plan to start making sheep’s milk cheese soon. In 2017, they will also open five rental cabins on the farm allowing their guests to enjoy all the farm’s offerings while enjoying amazing views of the surrounding hills and woodlands. The farm is located near Woodstock and Quechee, and they hope to offer a unique agri-tourism experience to the area’s many visitors. Rachel Berg is a Connecticut local, having grown up in Bethany and run competitively on the Hopkins cross-country team in high school. Before studying history at the University of Chicago, she joined the Howard Dean for America campaign, where she worked in the scheduling office. After college, feeling driven to use her hands and her brain, she spent a winter WWOOFing in Washington State. The next year she found herself back in central Connecticut managing farmers’ markets for CitySeed and volunteering at Boulder Knoll Community Farm in Cheshire. In 2010, she became a volunteer at Massaro, and realized that farming was more than a passing phase. She left Massaro after three seasons to attend the University of Vermont’s Farmer Training Program, but came back again when the program was over to join the Four Root Farm team. Besides baking the best challah on the face of this green earth, Rachel also displays great enthusiasm for dried bean shucking and milling her own grains (both painstaking and time-consuming tasks, take note), loves presidential history and spreadsheets almost as much as she loves farming, and she can smell a ripe cantaloupe from – literally – a mile away. Katie was drawn to agriculture after spending time on a conventional dairy farm in New Haven, VT during her senior year of college. She was struck by the ways in which the farmer’s work, family, land, history, and values all coalesced in the day-to-day functioning of the farm. After graduating, she spent years teaching gardening and botany at inner-city public schools in New York, but the urban environment felt too disconnected from agricultural landscapes and ecosystems. Then in 2013, she did the Farmer Training Program. The experience changed her life in so many ways, learning about how we produce food was and is so empowering for her. 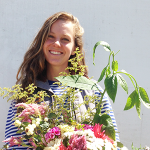 After completing FTP, she spent the next two growing seasons farming full-time in California and Vermont. 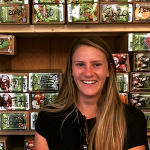 This past fall, Katie began a Master’s of Science program in Food Systems at UVM. Through her studies, she wants to use science to support the continued development of an agriculture that is capable of holistically supporting both people and ecosystems. So far in graduate school, she is enjoying being around other people who are both farmers AND nerds; it is also a great place to be as she tries to make eating, farming, and learning a more political act every day! 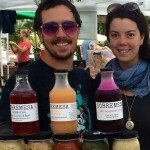 Caitlin and Jason own Sobremesa, an artisanal fermented foods company based in central Vermont with her husband Jason (also FTP ’13). Sobremesa is a Spanish word that refers to the time spent lingering around the table after a meal. This name is at the heart of why they grow and make food. Sobremesa is a time to digest and savor food, family, and friendship. 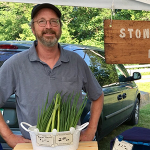 The Elbersons enjoy selling their products at the Burlington and Stowe Farmers’ Markets and a number of local farm stands and stores. In fall of 2014, they moved to Marshfield, VT where they purchased a 7.5-acre homestead that they named Wild Rhythms Farm. They grow vegetables, herbs, berries, and are excited to establish perennials. They tend to a diversified flock of laying hens and Chocolate Muscovy ducks, and raise a small flock of Icelandic and Border Leicester sheep. Before attending the Farmer Training Program in 2013, Caitlin and Jason were living in Pennsylvania, where Caitlin worked as Director of Development at a Waldorf School and Jason worked as a mechanical engineer. After FTP, they spent one season milking cows at Stony Pond Farm in Fairfield, VT. Caitlin manages the Stowe Farmers’ Market and both Jason and Caitlin work part-time seasonally at High Mowing Organic Seeds. 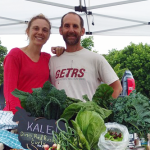 Caitlin and Jason began FTP with the goal of beginning their own business, and the two are grateful to FTP for helping them feel prepared to dive right in. 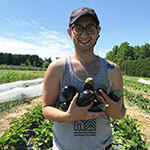 Tim graduated from UVM’s Farmer Training Program in 2012 with a five-year plan. The plan was to farm in Burlington’s Intervale for Sugarsnap farm-to-table cafe for two seasons and then to purchase and develop his own farm. So far, he is on track. Tim and his wife, Marie, own Stone Beach Farm, a certified organic farm, where they grow diverse vegetables and flowers on excellent river bottom soil. Tim and Marie are happy to be on a beautiful site right on the Huntington River in Richmond, Vermont.